NEW! We are now offering face-to face practice TExES examinations in different certification areas including EC–6 Core Subjects to the general public. TExES exams are required for certification for all Texas educators. 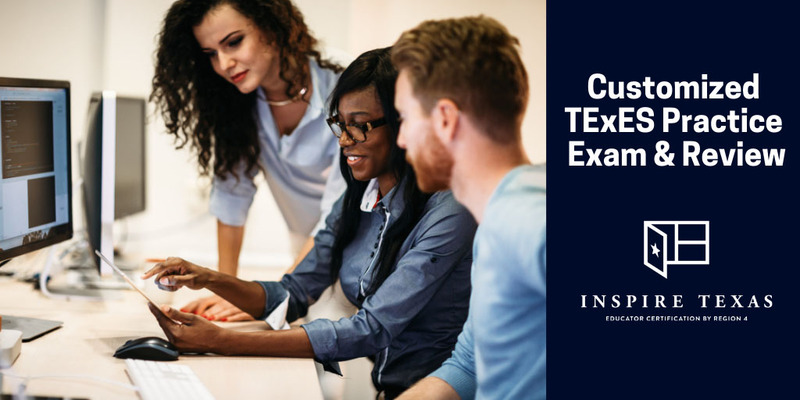 This EC–6 Core Subjects Practice Exam and Review is for those candidates interested in passing the state TExES (Texas Examinations of Educator Standards) exam. This session will include a practice exam that resembles the exact times used in the real TExES EC–6 Core Subjects exam, in addition to an expert instructor who will review your correct and incorrect responses. We will help the participants build their own profile to create a plan for successfully passing the exam. Questions? : Email us at info@inspiretexas.net. If you are a paraeducator receive a 50% discount on your TExES practice exam. Please email info@inspiretexas.net and provide your school email address to receive the discount code. If you are a certified teacher receive a 50% discount on your Bilingual, ESL or Special Education TExES practice exam. Please email info@inspiretexas.net requesting your discount code. PPR (Pedagogy and Professional Responsibility) April 6, 2019 8:00 A.M. – 4:30 P.M.
EC–6 Core Subjects April 6, 2019 8:00 A.M. – 4:30 P.M.
Special Education EC–12 April 6, 2019 8:00 A.M. – 4:30 P.M.
PPR (Pedagogy and Professional Responsibility) June 15, 2019 8:00 A.M. – 4:30 P.M.
EC–6 Core Subjects June 15, 2019 8:00 A.M. – 4:30 P.M.
English as a Second Language (ESL) June 15, 2019 8:00 A.M. – 4:30 P.M.
Special Education EC–12 June 15, 2019 8:00 A.M. – 4:30 P.M.
4–8 Generalist Core Subjects June 15, 2019 8:00 A.M. – 4:30 P.M.
Bilingual Supplemental June 15, 2019 8:00 A.M. – 4:30 P.M.
Bilingual Supplemental September 14, 2019 8:00 A.M. – 4:30 P.M.
PPR (Pedagogy and Professional Responsibility) September 14, 2019 8:00 A.M. – 4:30 P.M.
EC–6 Core Subjects September 14, 2019 8:00 A.M. – 4:30 P.M.
English as a Second Language (ESL) September 14, 2019 8:00 A.M. – 4:30 P.M.
Special Education EC–12 September 14, 2019 8:00 A.M. – 4:30 P.M.
4–8 Generalist Core Subjects September 14, 2019 8:00 A.M. – 4:30 P.M.
PPR (Pedagogy and Professional Responsibility) December 7, 2019 8:00 A.M. – 4:30 P.M.
EC–6 Core Subjects December 7, 2019 8:00 A.M. – 4:30 P.M.
English as a Second Language (ESL) December 7, 2019 8:00 A.M. – 4:30 P.M.
Special Education EC–12 December 7, 2019 8:00 A.M. – 4:30 P.M.
4–8 Generalist Core Subjects December 7, 2019 8:00 A.M. – 4:30 P.M.